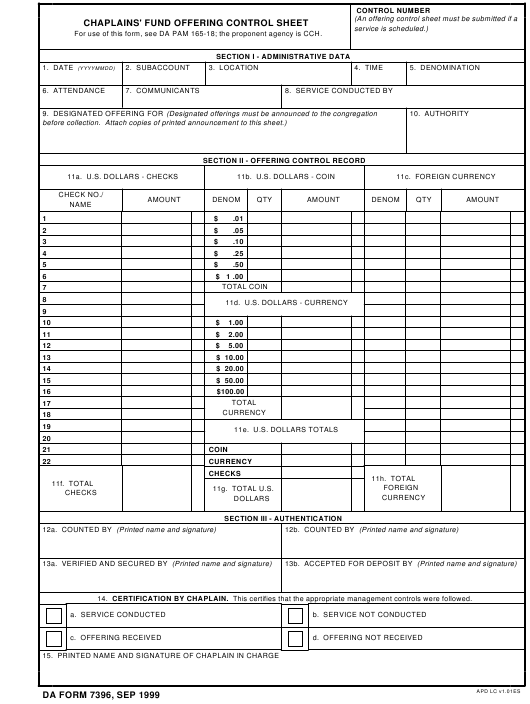 DA Form 7396 or the "Chaplains' Fund Offering Control Sheet" is a Department of the Army-issued form used by and within the United States Military. The form - often incorrectly referred to as the DD form 7396 - was last revised on September 1, 1999. Download an up-to-date fillable DA Form 7396 down below in PDF-format or look it up on the Army Publishing Directorate website. For use of this form, see DA PAM 165-18; the proponent agency is CCH. 14. CERTIFICATION BY CHAPLAIN. This certifies that the appropriate management controls were followed.